Across the UK, you can get your Crêpeaffaire goodies delivered to your door via Deliveroo, Uber Eats and now Just Eat at certain stores! So when you don’t fancy popping in to say hi, you can enjoy your crêpes, waffles, shakes or smoothies from the comfort of your home (or wherever you may be!). 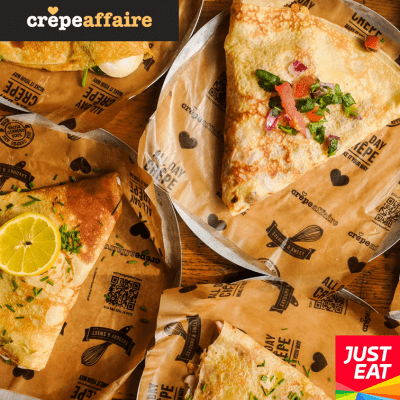 As of June 2018, you can now order your crêpes via Just Eat for delivery or collection, exclusive to Leeds. Want some help with our Just Eat menu? Not only have we got some awesome flipping crêpes, sweet or savoury, on our menu, we also serve and deliver wonderful waffles, milkshakes, smoothies and more! Did you know? Our crêpemasters can whip up fresh and tasty crêpes made from organic flour and natural ingredients as you like it? You can build-your-own crêpe or gluten free vegan buckwheat galette from scratch. Just pick & choose your ideal fillings from our vast range of yummy sweet and savoury options.